The timber hitch is a knot used to attach a single length of rope to a piece of wood. This knot is easily undone after use. To make the knot, pass the rope completely around the wood. Pass the running end around the standing part, then through the loop that you have just formed. Make three turns around the loop then pull on the standing part to tighten. 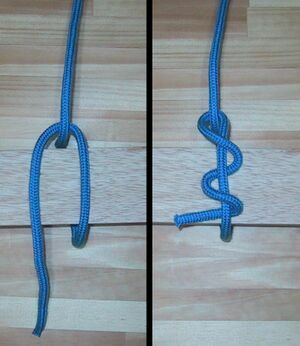 Take care that you double the rope back on itself before making the three turns, or it won't hold. Three are recommended for natural rope such as jute, whereas five turns are needed on synthetic rope like nylon. This page was last edited on 24 June 2013, at 15:31.